"Marian" is the name of my favourite Indiana Jones character (you already know of my Indy love). It's also the name of one of my favourite fruits - the marian or marian plum, botanical name Bouea Burmanica, known as ma-yong or maa-prong in Thailand. Marians aren't lovely, luscious orbs of juicy sweetness however. 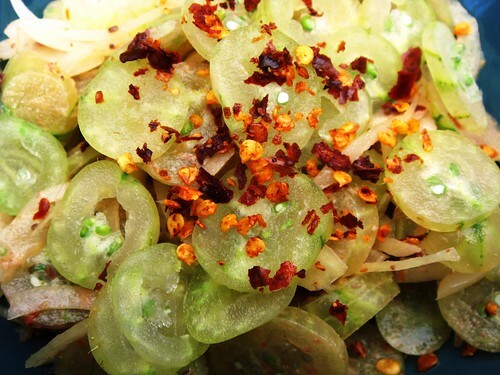 Even when ripe, they're mouth-puckeringly sour and they're a vital component of one of the best Burmese salads ever. Unfortunately, as far as I know you can't get marian fruit in this country. Even in Burma, marians or mayun-thee is only available seasonally, and I always seem to manage to miss them whenever I get over there. 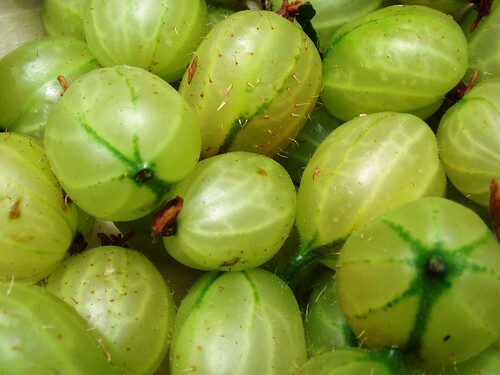 However, there's always a substitute for an impossible ingredient and my mother discovered long ago that gooseberries make a respectable replacement. 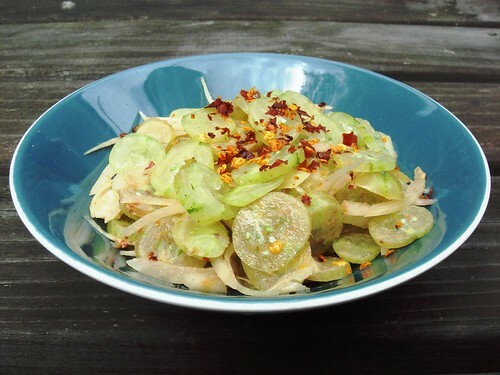 Since then, every June, I've bought up the very first "goosegogs" available (thanks Tasty Tottenham) to make this salad. Marian salad is eaten as a side dish with pork or beef curries and rice. You'll find that the sharpness of the marians cuts perfectly through the richness of the meat and that sourness in turn is offset by the comforting blanket of rice. 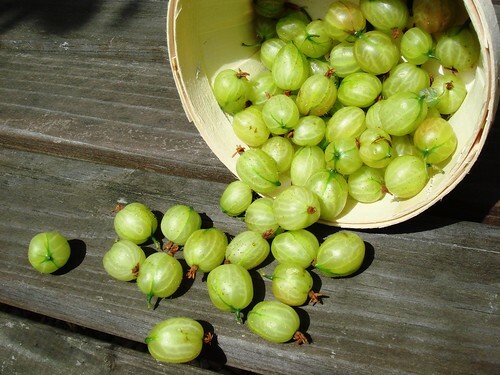 Use the greenest, firmest, tartest gooseberries you can find - the smaller, yellow dessert gooseberries are no good. You also need some ngapi (fish paste, the very lifeblood of Burma) or failing that, some belacan (Malaysian shrimp paste) will do. Char the belacan over a flame (I use a chef's blowtorch). Dry fry the chilli flakes in a pan till they are toasted and semi-smokey. If using the gram flour, dry fry this as well until cooked through. Top and tail the gooseberries and then slice them into thin rounds. Slice the onion super-thin, so the slices look transparent. 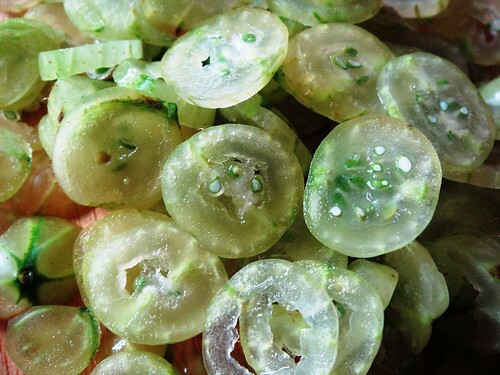 Combine gooseberries and onions in a salad bowl, and crumble the charred belacan all over. Add the toasted gram flour or peanut butter, oil, MSG and chilli flakes (reserve a few flakes). Mix thoroughly - the Burmese way is to get stuck in with your hands, and in fact one of the most famous Burmese salads is called let thohk - literally "hand-tossed". Sprinkle the reserved chilli flakes on top and serve immediately with curry and steaming rice. Of course, you could always eat the salad by itself, but then you will end up looking like a lemon baby. 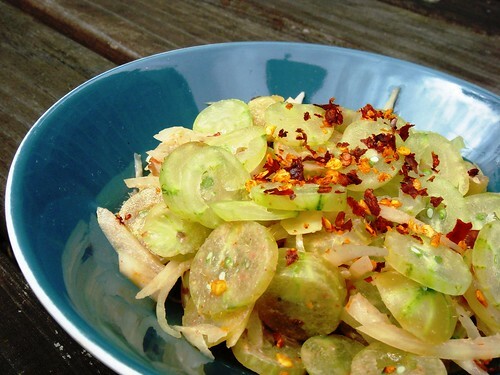 Thanks for the recipe — I'm in love with Burmese salads. I've just added your site to my blogroll. 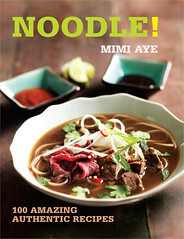 I've been posting quite a bit on Burmese food lately, and there's more to come. I'm happy to read your insights. Wow - hi Karen - I was just reading about how you and your hubby got deported from Burma! I must give this a try! Where can I get belacan?? Oh and I've just given you an award...visit my blog to pick it up! As for belacan - you can get it in any Oriental supermarket eg See Woo - search for "shrimp paste". "Kapi" is the Thai word for the same stuff. I sent you an email but not sure if it went to the right place (if it did, ignore this message). 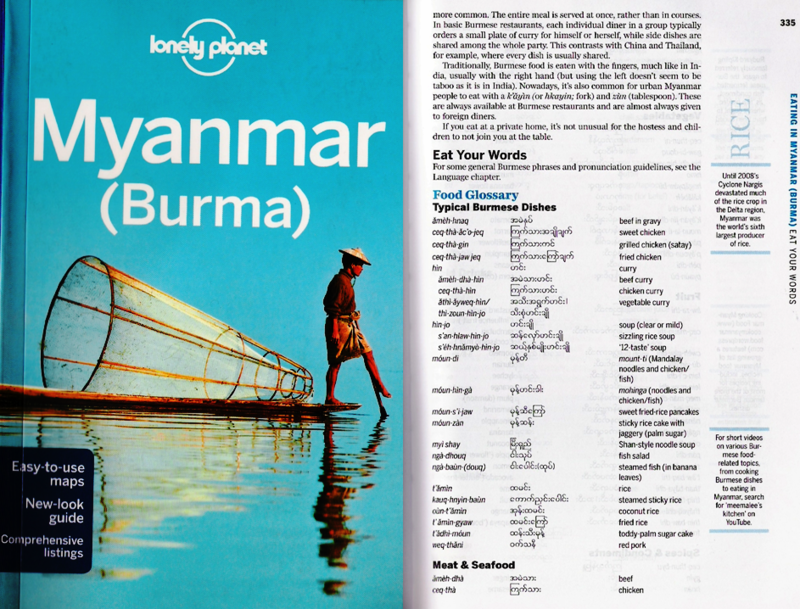 I'm looking for help finding "odd" fruits in Burma that will be available in December. Please email me with tips.